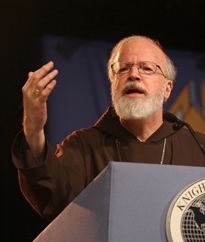 Roman Catholic Cardinal Sean O’Malley already calls himself a blogger. But now O’Malley is delving further into new media with a video podcast of his Christmas message to the masses. The podcasts — in English, Spanish and Portuguese — are part of a broader effort by the Boston Archdiocese to embrace new technology as a way to spread the church’s message. O’Malley, a Capuchin Franciscan friar who has taken a vow of poverty and is a frequent critic of consumer culture, is emerging as an unlikely technology pioneer. The cardinal’s first downloadable podcast messages will be available Christmas Eve at Boston Catholic Television’s revamped Web site, Catholic TV, at the iCatholic webpage. They will be followed by regular video messages from O’Malley starting in the new year.